We have been established for over 30 years and our nationwide client base has grown due to our skilled and professional service. With a wealth of knowledge and over thirty years of experience, we provide quality work for all our customers. We cater for homeowners, builders and architects. We are committed to the restoration and preservation of architectural features, combining traditional craftsmanship and modern techniques and materials to reproduce original features such as cornices, ceiling centres and corbels in precise detail and to an exceptionally high quality. For more information or to see if we can help you, call us today. 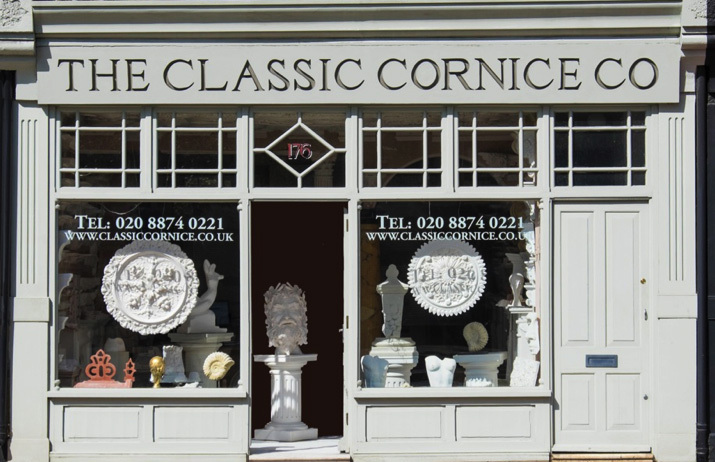 Our showroom is based in Wandsworth, South West London. Our extensive knowledge and empathy with various eras of interior decor enables us to match any classical feature with great accuracy. We restore existing features to their former glory by removing deteriorated sections and casting and replacing them, in order to preserve the style and charm of the original period. We take pride in the competitive prices we offer so you can rely on us to restore your property cleanly and efficiently. For more details or to discuss your individual requirements, contact us today.